Select Tools > Code > Instant Generator from the toolbar. 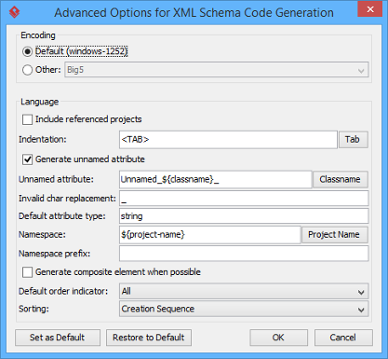 In the Instant Generator window, select XML Schema as the Language. Fill in the Output Path, which is the directory where you want the code to generate to. Select the classes to generate code. In the Diagrams tab, you can select the diagrams to generate code for classes in the selected diagrams. 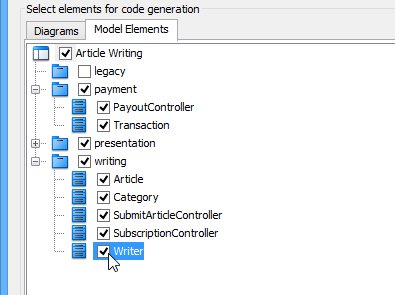 Alternatively, open the Model Elements tab and select the classes to generate code. Optionally configure the generator options. Read the section below for a description of options. Click Generate to generate code. 1 Language The programming language to generate. 2 Model element tree A list of packages and classes that can be selected for code generation. You must select classes for code generation. 3 General options Some of the common configurable options are shown here. You can configure them in advanced options. 4 Output path The folder where you want the code files to be generated. 5 Template directory Template governs how code will be generated from model to code. You can customize the template to suit your needs, such as to print company specific headers to each code file. If you want to use your own template, provide the template directory here. If you want to keep using the build in template, leave this option unchanged to let Visual Paradigm generate with build in template. To learn more about customization, read the final chapter of this part. 6 Advanced options Click this button to configure any options related to code generation in a new window. 7 Prompt to confirm overwrite file If a code file instant generator going to generate is already exist, by checking this option you will be asked whether to overwrite that file or not. If you uncheck this option, it will help you to overwrite the existing file automatically. 8 Output pane Any warning, error or progress about generation will be printed here. 9 Open output folder Open the output path with system browser. 10 Preview Click to preview the code content. It is just a preview and code will not be generated to the output path by previewing. 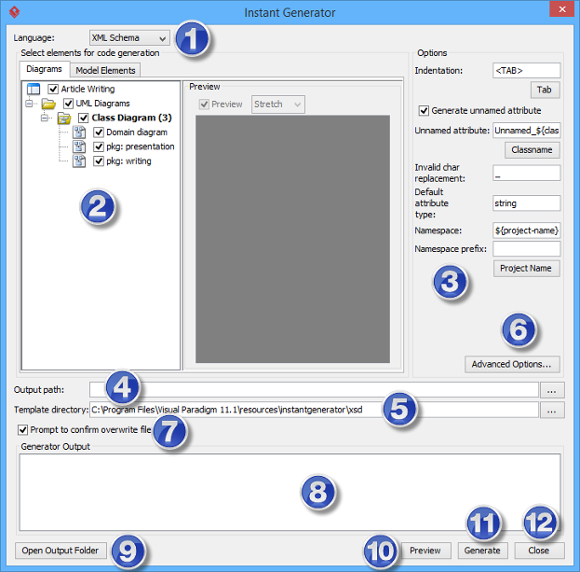 11 Generate Click to start generation. 12 Close Click to close the instant generator. On the Instant Generator window you can configure some of the common code options at the right of window. You can also configure the advanced options for more detailed settings by clicking the Advanced Options… button. Below is a description of available options. Encoding The encoding of source file. Allow From Linked Project Check to generate also classes in referenced project. Indentation Character(s) being used for indentation. Default is Tab. Generate unnamed attribute When two classes are associated, checking this option will generate attributes in both classes with each other as type. When unchecked, attributes will not be generated to both of them. Unnamed attribute Pattern will be applied when generating name for those attribute without name. Invalid char replacement Invalid char refers to characters that will result in a compile error when compiling code. This option is for replacing those invalid characters by given one. Default attribute type Attribute type that will be used when attribute has no type specified. Namespace Define a namespace for generated code.